Remember last year when my foodie obsession with Marx Foods began? I remember it like it was just yesterday, aahh that Mangalitsa ham *sigh*. Well, thanks to that very gorgeous piece of ham, I’ve been lucky enough to receive samples of their products as rewards for creating recipes. I’ve gotten so many goodies, it’s madness! The best part is that it allows me to stretch my foodie wings and palate and that makes me a better (and bigger) foodie, cook, aficionada, etc, etc. I submitted recipes for more of their contests, which means I’ve gotten more goodies. I have a box of yummy things in my pantry. Since work has been so hectic, I’ve not had much time to experiment in the kitchen, even less time to share the results with you guys. 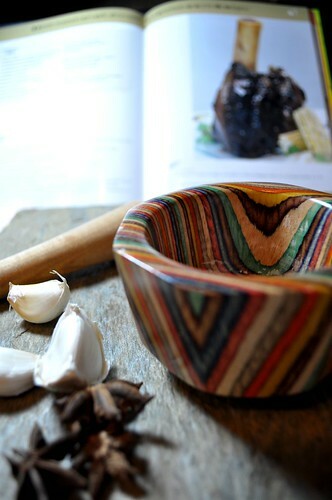 But I’ve been dying to tell you about a couple of dishes I came up with using some of my loot. This post is not a very good step-by-step one. I blame it on work and exhaustion, that said, these two dishes are way too good not to share with you! Oh.eM.Gee!!! These were sooooo good! I’m drooling just thinking about them. Keep in mind, many of the spices were gifts from the good Marx Foods peeps, they are not paying me to say good things about them. What they do want is some honest feedback about their products and hopefully, if all is good, that may generate new customers for them. I know I’m onboard. OK, that’s my little disclaimer, on with the food! good, doesn’t it? I can’t tell you how good they both were, but I’m gonna try. Let’s start with the soup. You probably know I’m a huge fan of chayote squash, it was one of the few veggies my Mami could get me to eat when I was a kid. As of late, I’ve been using them in a few new-to-me ways, you can find some really good recipes on my blog by doing a ‘chayote’ search. This little vegetable has a very mild taste most similar to a yellow squash IMO. For the soup, I used a variety of dehydrated mushrooms, oyster, porcini and shitake, from Marx Foods. I steeped them in hot water for about an hour, then strained them out and used the reserved liquid to cook the chayotes. I ran the mushroom broth through a coffee filter to catch any grit–though there was none to be found. I peeled and cubed 3 chayotes, then cooked them until tender in the mushroom broth (you may need to add&nbsp;a bit more water, just enough to cover the chayotes. The broth was seasoned with Smoked Salt. Once the chayotes are tender, run them through the blender to puree the soup. Return to the pot and add heavy cream, about 1/2 cp or to taste. While the chayotes cooked, I roughly chopped the mushrooms and sautéed them in 2-3 tbsp of butter. I added 1 tsp ground Tellicherry Peppercorns, more Smoked Salt and about 1/2 cp of dry sherry that was cooked into the mushrooms. Keep warm. 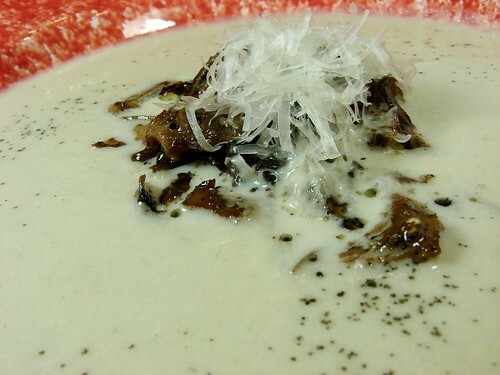 To plate: pour the cream in your bowl, top with a dollop of the sautéed mushrooms, a sprinkling of the Smoked Salt and grated Manchego or Parmesan cheese. Now, what can I tell you about the entrée…??? I had never cooked beef cheeks before, but I find myself obsessed with them now. I will admit it isn’t one of those things you can make on the fly, because that meat needs to be brought into submission before making it magical. I certainly hope you give it a try, the rewards are indescribable. 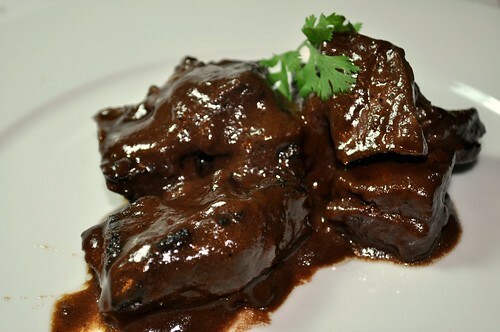 The meat is melt in your mouth tender and possesses a sweet unctuousness about it. For this recipe I finished the cheeks with Guajillo & Ancho Peppers and a bit of Fennel Pollen, this gave the final dish a perfect balance of sweet, savory and spiciness that had The Hubbz and I swooning over our plates. The above decadence sat atop rice cakes that had been laced with White Truffle Oil and cream before being crisped in butter. The scent and taste of the Truffle Oil was so rich and intoxicating, it played beautifully against the other ingredients. I then channelled Iron Chef Symon and topped this concoction with a watercress salad that helped cut through this incredibly rich plate. Let’s get to it, shall we? 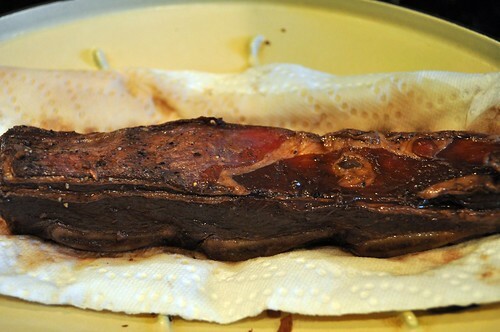 To prepare the beef cheeks, I removed any excess fat and tendons early in the day, just before allowing it to braise for an hour or so in water that was seasoned with a couple cloves of garlic (peels and all), bay leaf, salt & pepper. 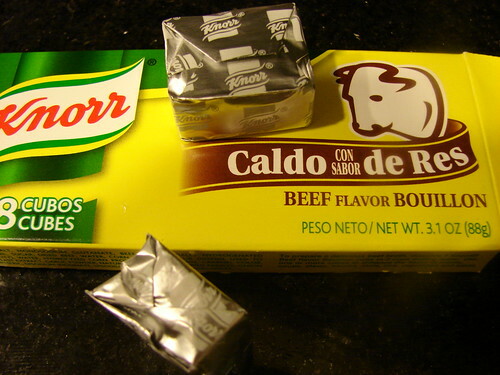 Once tender, cut into cubes, but make sure to reserve the broth produced. I simmered 2 guajillos and 2 anchos in about 1 cp of the reserved broth, just until they became soft, about 10-15 minutes. If you want to minimize the heat in the dish, remove the seeds before steeping the peppers. I allowed the peppers to cool just enough to handle and chopped them up and added them to a hot pan with about 1tbsp of extra virgin olive oil, followed by 2 tsps of Fennel Pollen, the zest of 1 orange, 1/4 cp of dry sherry, the cubed meat and seasoned with salt & pepper. I added enough of the reserved broth to simmer the beef until it was melt-in-my-mouth tender, about 30-40 minutes. While the cheeks cooked, I added 1 tbsp of White Truffle Oil and 3 tbsp of heavy cream and 2 tbsp of finely chopped chives to about 2 cps of cooked leftover jasmine rice. I formed the mixture into 4 patties and placed them in the freezer for about an hour to make them easier to handle. Once they were firm on the outside, I ran them through a breading station: flour-egg-panko crumbs. These were then crisped in a skillet in a combo of butter and oil until golden brown. I made a make-shift vinaigrette for the watercress, by combining the juice of the orange with a bit of Truffle Oil (probably less than 2 tsps), I dressed the watercress with the vinaigrette and a sprinkling of salt & pepper just before serving. 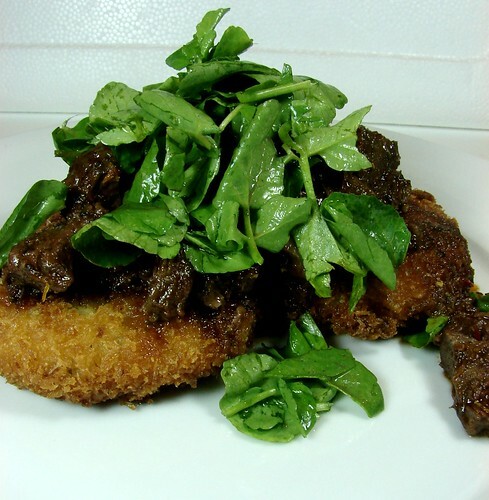 To plate: I placed 2 rice cakes on the plate, topped them with the beef braise and topped that with the watercress salad. Once you make this and take the first bite, you really will think you died and went on to happy orgasmic heaven. 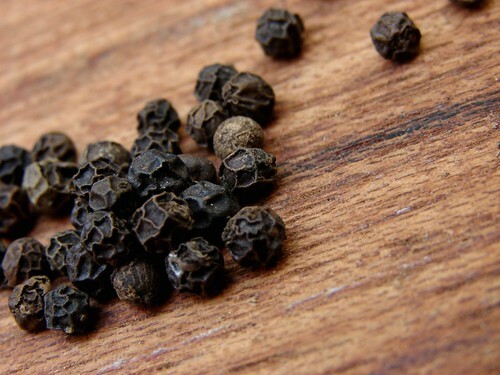 Tellicherry Peppercorns: I love these and will be adding them to my pepper mill. Its black peppers on roids! Really big, bold peppery goodness. A must have. Smoked Salt: I think it is really cool just to look at, but the flavor it adds to your food is surprising. It really makes it taste smoky. Really excited to have my hands on this one. 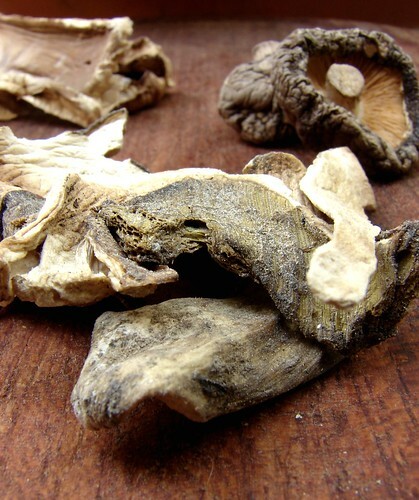 Dried mushrooms : These were good, but I wasn’t wild about the texture of them, it made me think of seaweed. I still have some left and will try them again, because I think I might’ve not reconstituted them properly. For now, I’m sticking to the fresh stuff. 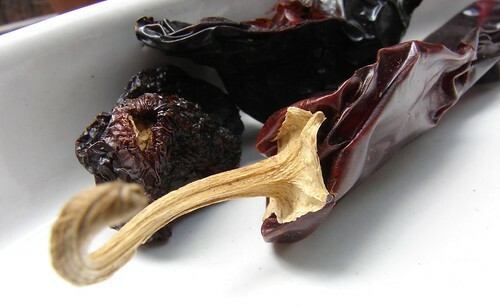 Dried Guajillo and Ancho Peppers: I simply love these and I’m pretty familiar with them and have them available at almost every grocery store here in town. I did notice that these seemed ‘cleaner’?? Sometimes when I pick them up at the grocers here they look ‘dusty’ and I rinse them before use. The Marx peppers were ready to go. 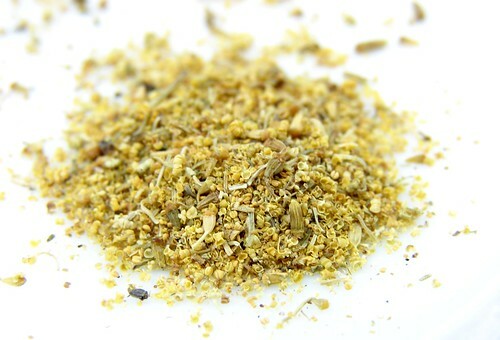 Fennel Pollen: Yeah, another keeper. This was the second time I incorporated it into a recipe and I absolutely love it! White Truffle Oil: This baby is sooo good, it should come with its own choir so that you here them chant ‘aaaaaaaaah’ everytime you open the bottle. Gimme, gimme! There’s more Marx Goodness to come, so stay tuned. 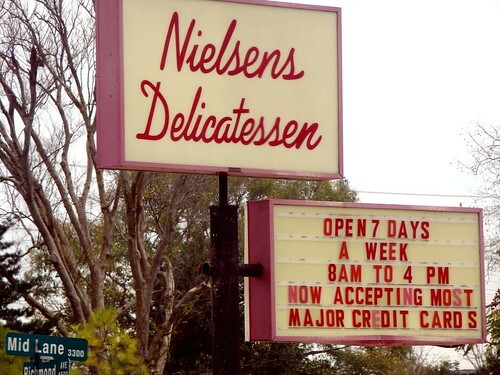 At the corner or Richmond and Mid Lane sits an unassuming establishment called Nielsens Deli. I had driven by this place countless times since moving to Houston, but never thought about stopping by, I imagined it was just a deli selling deli meats. Recently, a good friend invited me out for a quick lunch promising me I would have the best potato salad and deviled eggs EVAH! Off to Nielsens we went. As you walk into the stand-alone building, you’ll come into a long narrow room, the deli counter will be just a couple of feet and directly across from the front door, that’s where you place your order, unless you’ve called it in. 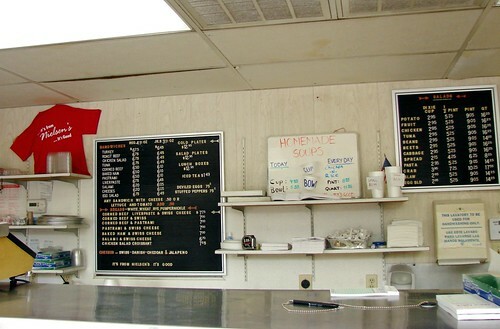 Turn right and to the opposite end of the room, pick up some chips and pay for your order. If you’re dining in, you can grab one of the stools lined up against the storefront glass. If you’re feeling particularly playful, tease the incoming customers as they come up to the counter. Ok, this is a food blog, right? Let’s talk shop. First, I was tickled by the lingo I heard as I approached the counter. The customers, regulars no doubt, have learned how to properly order their meals: ‘a Jr Corned beef, extra spread on rye and a pixie potato salad‘. It made me think of a kinder, gentler soup Nazi. I’m not a big sandwich person, it just doesn’t seem like a meal, but these sandwiches are awesome! 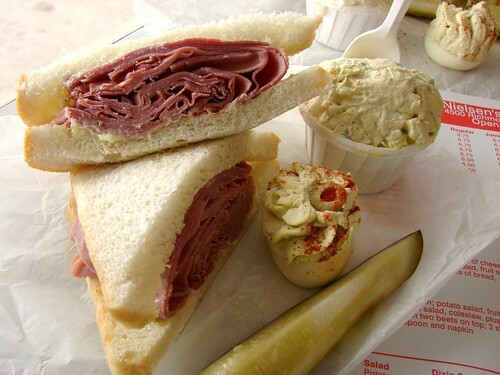 I had the corned beef on white with extra spread (they make their own mayo…OHMY! ), an egg and a pixie of egg salad. Let me tell you, this corned beef was good and piled high on the homemade bread. No skimping here. 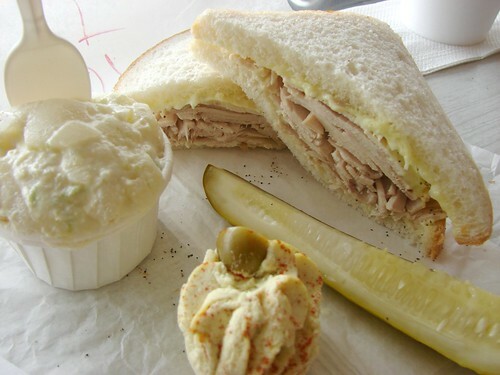 Anni had the turkey on white, extra spread an egg and a pixie of potato salad. I had a bite of her turkey and was surprised by how flavorful it was. They’ve been roasting their own turkey breasts since the deli opened in 1952, I think they have it down. Now. For the really exciting part. Those sides. I love potato salad, but not the mustardy kind and not with a bunch of stuff in it. KISS (keep it simple, sweetie) is my motto. And KISS it they do. Loads of their amazing homemade mayo, piled with eggs and celery for some crunch, this potato salad ROCKS! It is so good that years ago Gourmet magazine sent a letter requesting their recipe! Then we go into the deviled egg territory. Insanity, that is all I can say about it. Next time I go, I will have the chicken salad sandwich, apparently it is incredible. And I believe it, because I had a pixie of the egg salad… it was as if they just chopped the deviled eggs and stirred it all up. 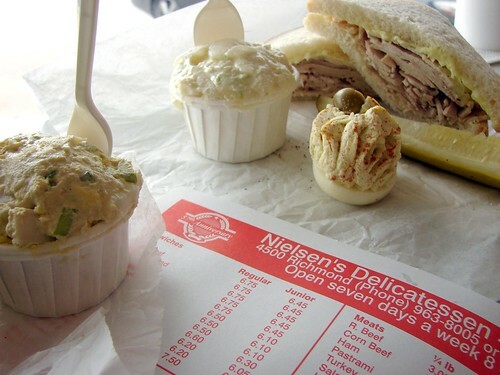 If you’re from Houston, you should definitely visit this Houston institution, do it soon! It’s just inside the loop at Richmond. If you’re coming to Houston for a visit, put this one on the list. Have you ever heard of Johnny Mazzetti? If you’re Panamanian (or have lived in Panama) you probably do. Funny thing is, in putting this post together, I came to learn about the history behind the dish. I don’t think I believed this to be an original recipe by my mother, though I still think of it as her dish. Johnny Mazzetti, the dish, is very popular in Panama, so I Googled it. Turns out the dish originated in Columbus, Ohio at a restaurant called Marzetti. Leave it to Panamanians to change someones name. Nonetheless, this was one of my Mami’s favorite party dishes because of how easy it was to prepare and how much mileage you could get from it, I mean, it goes a loooooong way. Like any other popular recipe, Johnny Mazzetti has many incarnations. 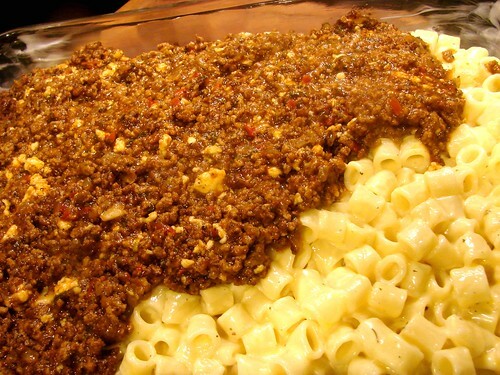 My mom would make hers with olives, raisins and boiled eggs, in essence, you make picadillo and grow it with pasta. I must confess that I made this a few months ago, I was yearning for some comfort food and the memory of it came rushing back. I also have to confess that this is not really my mom’s recipe. It has been seriously adulterated… for the better. Not that there’s anything wrong with the original recipe, I just wanted…more. 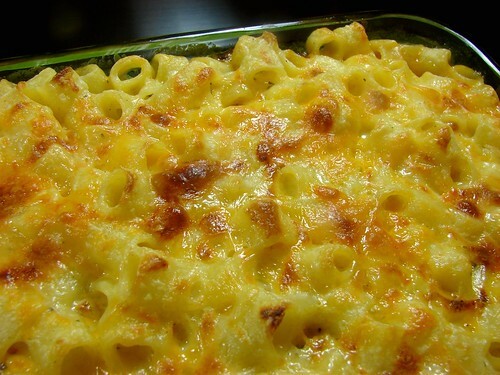 So I brought together 2 comfort foods: mac ‘n cheese and Johnny Mazz and ended up with a casserole of goodness. And you get dibs. 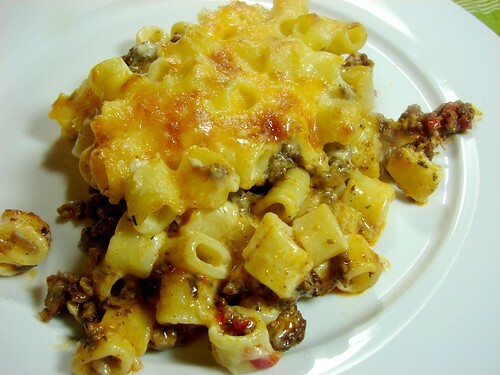 Heat a medium skillet over high heat and add the ground beef and the next 4 ingredients, stirring well to evenly distribute the seasonings. Allow the moisture of the beef to evaporate, before adding the onions, serranos and bell pepper. Cook until the onions are translucent before adding the cilantro and tomato puree. Add the broth or water and check and adjust the seasoning as needed. Allow it to simmer for about 15 minutes over medium low heat. Stir in the Cotija cheese. 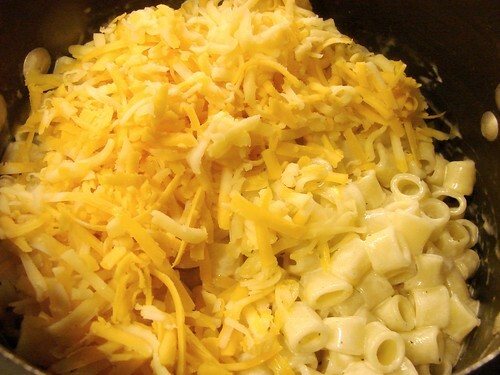 Cook and drain the pasta, then add the milk, cream and crema over low temperature. Add the cheese and butter, stirring until dissolved. Season with salt, pepper and nutmeg. Preheat oven to 375°. 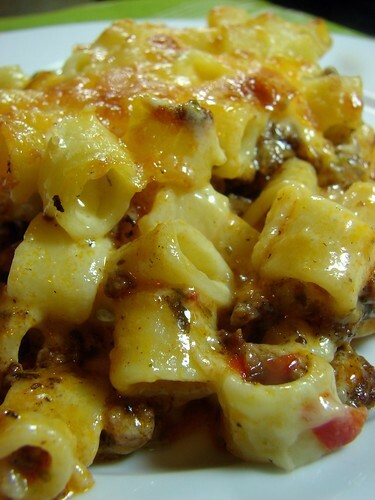 Liberally butter a baking dish and spoon half of the pasta, top with all the beef, then the rest of the pasta. Bake for about 20-30 minutes or until bubbling. For more yummy shots, click here. Rumor has it that temperatures are dropping. I have to say this is a rumor, because we, in Houston, must’ve been left off the memo distribution list. I will try not to take it personally, though I’m not sure I’ll be able to keep that promise. Nonetheless, I am here to tell you soup is on the menu. 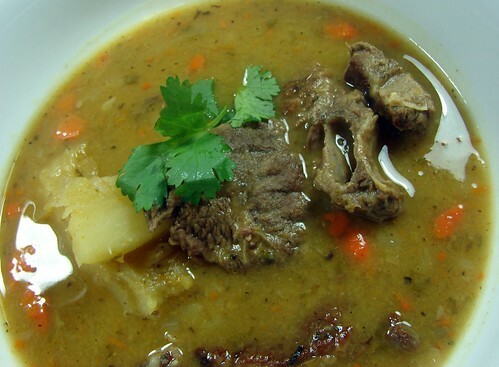 Truth be told, in Panama we have soup any and/or every day of the week. Weather be damned. It’s always hot in my little country, we like soup, we have soup. This one is a favorite of mine. My Gramms used to make it for me when I was little. 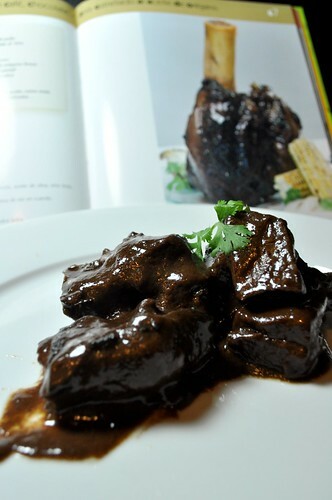 She would make it various cuts of beef, sometimes with pecho (which comes from the rib area), jarrete (from the shanks), and sometimes with patas (cow’s feet). The constant is the bones. 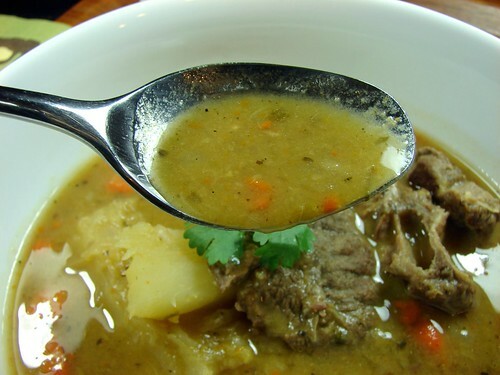 Bones are the best gift you can give soup, they help intensify the flavor of the broth. If they bother you, feel free to remove them after cooking, the meat will literally fall off the bone by the time the soup is done. This will make a large pot of soup, which is the only way I make soup. I want to have it for a couple of days. Beef: Liberally season the short ribs and shanks with Italian seasoning, salt and pepper, set it aside while you get the other ingredients ready. Split peas: Remove any damaged lentils or debris and rinse in cool water. Add enough water to cover and allow them to soak. Set aside. Cut the yuca and otoe into pieces about 2-inches long. For the yuca, use a sharp knife, slit the peel off each section. Make sure you slit through the 2nd pinkish layer until you hit the fleshy white meat. At this point, use the sharp edge of the knife and push through the 2nd layer. Rinse and cut into 1-inch pieces. Check out this post for step-by-step instructions. For the soup: Heat up a large stockpot and add about 1 tbsp of oil, smear it around. Brown the beef on both sides. 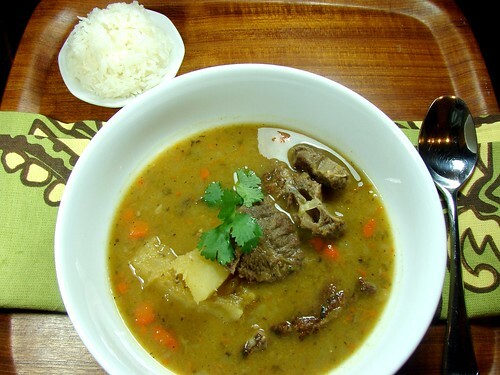 Once all the beef is browned, add the drained split peas, 1/2 of the yuca and otoe, all the carrots, the stemmy end of the cilantro, and the bouillon. Fill the pot with water, about 12-15 cps or so. 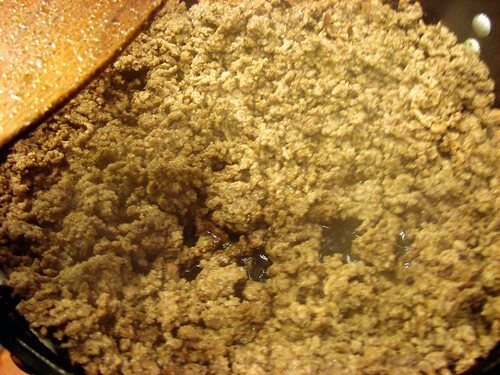 Allow it to come to a boil, and remove the foam that forms at the top when it boils. 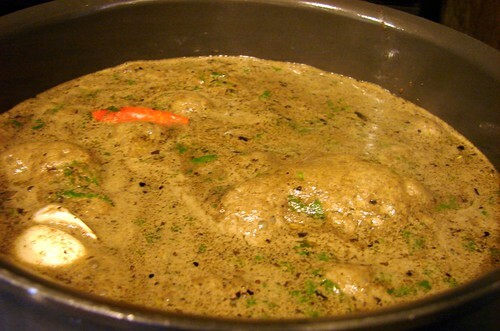 Lower the temperature to medium and allow it to come to a strong simmer. Stir it every few minutes, you want to make sure the split peas are not sticking to the bottom of the pan as that would cause the soup to scorch. Allow it to simmer slowly for about 1-1/2 hrs for the beef to soften. At that time add the rest of the tubers and cilantro. Check the seasoning and adjust at will. Allow it to cook for another 30 minutes or so. 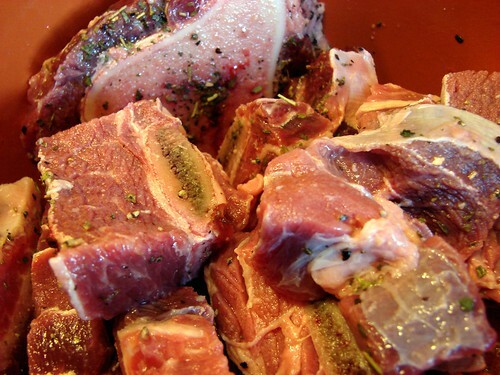 If you used boned short ribs, you can pull those out to remove the bones and cut the meat to bite-size portions. Serve with white rice If you want to see more soupy shots, follow this link to my photostream. Did someone say National Chili Month? I think its funny how there are months for everything, but I’m not going to lie and say I don’t enjoy the ones devoted to food. Well, unless it happens to be a food I don’t enjoy, like bananas. A little birdie told me October is National Chili month; I have to guess it’s due to the first visages of Fall (for most of the US states), temperatures begin to drop and people begin to crave hearty stews. Again, my guess. Living in Houston, I’ve come to understand people here and all over the state of Texas are big on the whole chili thing. There are festivals and cook-offs celebrated throughout the Fall, aimed at finding the best recipe. There are as may variations to chili recipes as there are people in Texas, but one thing I’ve come to learn is that real Texas chili does not include beans. 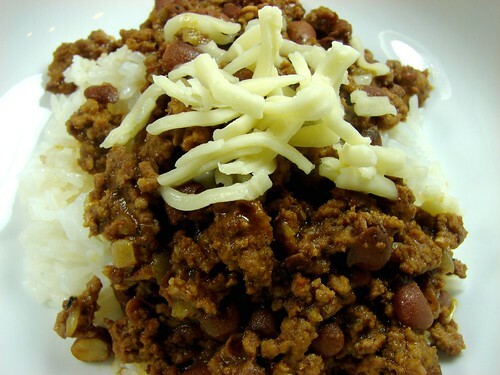 MY chili isn’t so much chili as it is Chile con Carne. Not Texan, probably not Mexican, but the variation I learned from my mom. Another difference here, is that more often than not, in Texas chili is served with cornbread. My version tastes best atop a heap of perfectly cooked white rice. I made it for The Hubbz not long ago and he loved it AND he’s a native Houstonian! So there must be something good there. As with all stews, aging is a virtue. The taste will improve and intensify every day after you make it. So why not give it a whirl? 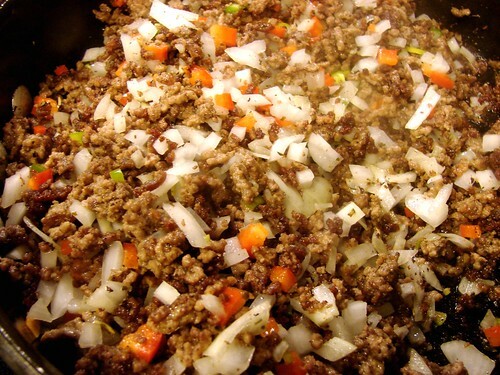 I don’t use a very lean ground beef for this, you won’t add any fat and you need some to cook the onions and develop some flavor. If I have the time and/or forethought, I will cook my own beans with 1 clove garlic and bay leaf, then use the cooking liquid instead of adding broth. I have used canned beans as often as I’ve used fresh, but I do rinse my canned beans and discard the canned liquid. You decide how hot you want it, add as many or as few serranos as you’d like. Heat a large pan over high temperature and add the beef, breaking it apart as you drop it. You can leave it in marble-sized clumps as it cooks; add the garlic, cumin and Italian seasoning at this time. The liquid from the beef will sweat out, as it evaporates, the fat will be left behind and you’ll be able to brown the beef. Lower the temperature to medium high and add the onions and serrano peppers. Continue cooking until the onions have softened and become translucent. 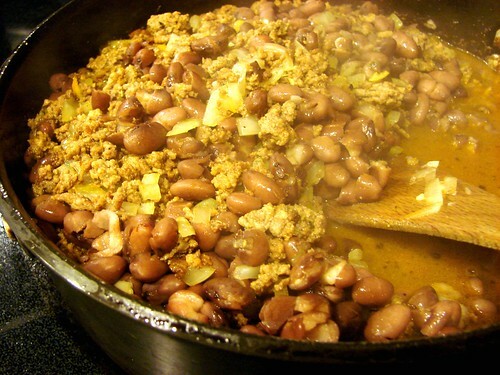 Add the beans and scrape off the goodness stuck to the bottom of the pan. 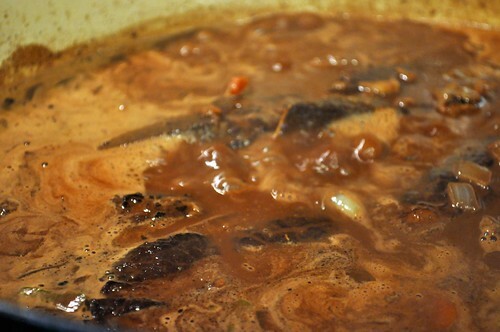 Then add the broth or liquid from the beans, enough to cover the beef. 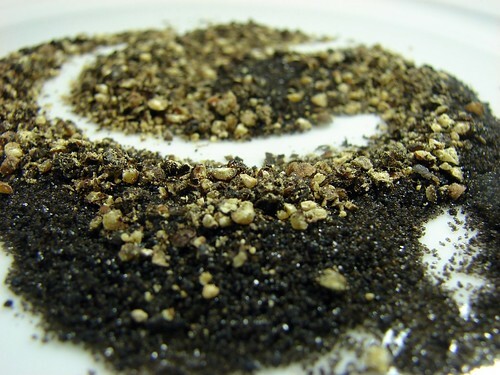 Adjust seasoning with salt & pepper as necessary, but keep in mind that the saltiness will intensify as it simmers. Lower the temperature to low, cover and allow it to simmer for about 40 minutes, stirring it every so often. 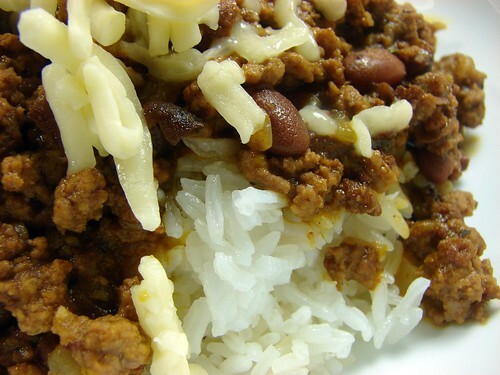 Serve over white rice and top with sour cream and/or cheese.